Summary: It’s been two years since Tark Halloway’s nightmare ended. Free from the evil spirit that haunted him all his life, he now aids the ghostly Okiku and avenges the souls of innocent children by hunting down their murderers. But when Okiku becomes responsible for a death at his high school, Tark begins to wonder if they’re no better than the killers they seek out. Review: I really enjoyed Rin Chupeco’s debut novel, “The Girl from the Well,” so I had high expectations for her sequel, especially because I didn’t know that she had planned a sequel. 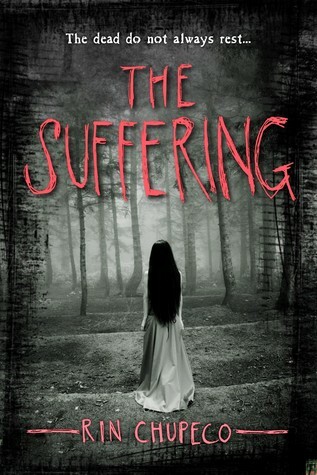 I was appropriately freaked out by “Girl form the Well,” and wanted to read more, so I was excited to be able to get an ARC once I learned “The Suffering” was available. And while I found “The Suffering” enjoyable (and extremely creepy at points), I didn’t enjoy it as much as I enjoyed Chupeco’s debut novel. I couldn’t figure out exactly why I didn’t fall in love with the novel, but then I realized that it’s Tark’s voice that I didn’t quite connect with this time. “The Suffering” is told from Tark’s perspective and I feel like a lot of the angst that he had in the first novel is now completely gone, making him seem like an entirely different person. Now, I know that the book takes place two years after the events of the first book, and I understand that people heal from their wounds, but he seemed too normal, almost too carefree for someone who is only a few years removed from a serious trauma. He had a darkness in him that I loved, and even though he still travels a dark path because of his connection to Okiku and her drive free the souls of tortured children, even then he seemed a bit too light-hearted for my tastes. To me, there was just something missing to Tark, and his light-heartedness seemed to take a bit of darkness from the novel. On the other hand, I just loved Okiku’s and Tark’s relationship. They know each other well, including each other’s quirks, and have developed a beautiful relationship. They have become dependent upon each other, not in a bad way, but in the way that you trust the person closest to you with your life; which in Tark’s case, his life truly in in Okiku’s hands. Their relationship was sweet and loving and built on mutual respect. Lastly, Chupeco upped the creepy factor in this book by having Tark and Okiku travel to an old village that is full of vengeful ghosts. The mystery of the village is intriguing as a number of young girls were sacrificed for a nefarious purpose and they are rightfully angry. One ghost in particular is the definition of a scorned woman taking her revenge; she scared the living daylights out of me (and anyone that was in her path). With the reveal of what actually happened, my heart broke and I could fully understand why all those ghosts would be so angry; the torture they experienced was horrifying. Despite the horror of the situation, however, the way Chupeco chose to resolve the mystery was beautiful and touching. In fact, the way Chupeco chose to end the novel was touching and even though she has stated that the original plan was a duology, I think fans would love to have another book. I know I would.